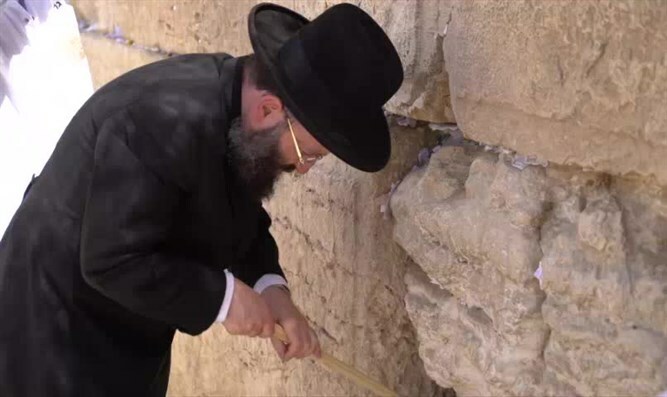 Ahead of Passover, prayer notes placed in Western Wall removed and stones of the wall checked. Ahead of the Passover holiday, workers from the Western Wall Heritage Foundation removed the prayer notes that were hidden by visitors over the past year between the stones of the Western Wall. The notes were removed in the presence of the rabbi of the Western Wall and the holy sites, Rabbi Shmuel Rabinowitz, and transferred to the Mount of Olives, where they will be buried together with worn-out holy books, as halakha mandates for writings containing God's Name..
Each year millions of notes are placed among the stones by Jewish and non-Jewish worshipers from Israel and abroad, including notes sent via the website of the Western Wall, fax and mail. Meanwhile, the Western Wall Heritage Foundation is preparing for Passover activities, within the framework of which the traditional priestly blessing will take place at the Western Wall plaza on Monday, April 17. Thousands of Jews and hundreds of kohanim (Jewish priests) are expected to take part.in the event.